Telegram - Winston Churchill to Franklin D. Roosevelt (April 16, 1941) 10:16 p.m. Telegram - Winston Churchill to Franklin D. Roosevelt (May 19, 1941) 8 a.m.
Winston Churchill to Franklin D. Roosevelt (May 29, 1941) 10 p.m.
Winston Churchill to Franklin D. Roosevelt (May 29, 1941) 10:17 p.m. 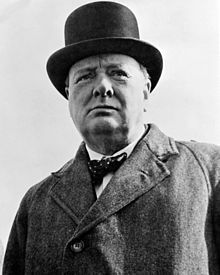 Telegram - Winston Churchill to Franklin D. Roosevelt (May 10, 1941) 3:38 p.m.
"Churchill, Lord Randolph Henry Spencer#Winston Churchill," in Encyclopædia Britannica (11th ed., 1911) Includes details about Winston, his son. This page was last edited on 26 March 2019, at 12:48.